Pulsing star discovered using a home computer's idle time. WASHINGTON (ISNS) -- Astronomers announced Thursday the discovery of a new star, found with help from a most unusual source -- a screen saver. Chris and Helen Colvin, owners of the personal computer running the screen saver are participants in a project called Einstein@home, an experiment in distributed computing which uses the donated idle time from hundreds of thousands of home computers across the globe in lieu of more expensive supercomputers. The June 11 discovery in Ames, Iowa of a pulsar -- a dense, rotating star that appears to pulse like a lighthouse beacon -- was confirmed on June 14 by another user's computer in Germany. It marks the first time an astronomical body has been discovered this way. "We've both been users since the beginning, but it was his desktop that got the golden packet," said Helen Colvin, who has a doctorate in human-computer interaction and attributes much of the find to luck. "It's just something that runs in the background and we don't think about it very much." Both Helen and her husband Chris work as computer professionals for Wells Fargo. The research team hopes to use the donated time from these computers to eventually find the gravitational waves which were predicted by Albert Einstein's theory of relativity but have never been directly detected. However, because of the huge number of volunteer contributors, the program also processes data from the Arecibo radio telescope in Puerto Rico looking for possible pulsars -- which are what's left after a massive star uses up its nuclear fuel and collapses under its own immense weight. "Volunteer computing takes advantage of the fact that there are more than a billion computers around the world," said Einstein@home director Bruce Allen. "The collaborative computing power of these computers is substantially greater than those from a supercomputer." With more than 50 distributed computing projects in existence and dozens more in development, the technology has become an increasingly popular way for scientists to process vast amounts of data on the cheap. Einstein@home takes data from Arecibo and LIGO and splits it up into individual work units to be processed by computers around the world. In this case, the data was actually collected in February of 2007 by Arecibo and sent out 157 times to volunteers before the pulsar was found hidden inside of it. Other distributed computing projects have been able to create simulations of physical systems using volunteered computers in this way, but Einstein@home claims this is the first time anyone has made a physical discovery with it. "There has been a lot of interesting research done by people like Rosetta@home and they have been finding a lot of things," said Michela Taufer project lead for another distributed computing project called Docking@home. Taufer added that while other projects may not have found anything new, the ability to model what you see happening in a physical experiment is important in itself. "You start with trying to validate your simulation results and you try to confirm what you see in the lab. So, it's a sort of validation and discovery." While the pulsar found was a somewhat rare type that rotates multiple times a second, discovering a pulsar is nothing new in astronomy. 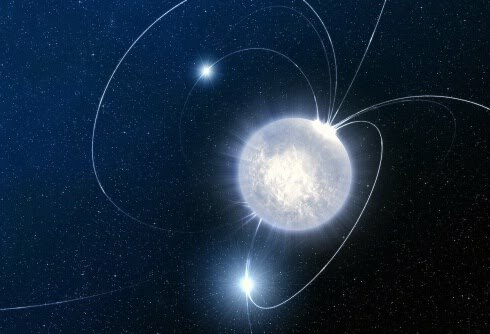 But the team said the Colvin's discovery, published in this week's Science, demonstrates not only the power of distributed computing, but also helps the search for gravitational waves -- which scientists believe may be emitted by pulsars. "We built it (the computer) ourselves with parts from a local computer shop, and anytime a part breaks we'll replace it with another," said Chris Colvin, who is a computer systems architect. "It's just one PC that's on a few hours a day. I'm sure there are a lot more people out there doing more than that." The Colvin's said they've been donating time on their computers since they were first dating as undergraduates at Iowa State and living in the dorms. Helen was a computer engineering major and many of the other students in her all female dorm were also science and engineering students. Lots of their friends were running another distributed computing program called SETI@home, which uses volunteer computers to search the skies for radio signals from alien civilizations. After seeing a story about Einstein@home on the popular tech news website Slashdot, the couple volunteered their computers to that effort as well. The team they now expect more discoveries to increase because of software upgrades made in March of this year and the increase in publicity they expect from the discovery. Though Allen doesn't suspect any gravitational waves will be detected on Einstein@home for at least another 5-10 years, he says the project plans to continue processing Arecibo data to allow the public to make more discoveries. The team also announced at their press conference that another discovery has already been made on computers in the U.K. and Russia, but the group plans to withhold the details until the finders of this golden ticket have been informed. Note: Einstein@Home was a project of the World Year of Physics, which was partially funded by the American Physical Society and the American Institute of Physics, publishers of Inside Science News Service. It marks the first time an astronomical body has been discovered this way.